When you’re a model brand that’s as established as Volkswagen, it’s only natural to realize that the majority of the line’s automotive offerings will be iconic in their own way. It’s to the point that in the hatchback world, the Volkswagen Golf stands alone at the top of consumers’ minds. As a legendary model to both city-dwelling professionals and suburban adventure enthusiasts, the Golf can take you wherever you want (or need) to go. To fully understand the VW Golf hatchback’s appeal in the American market, we’ll start you off in the context of its engine. Under the hood lies a 1.4-liter turbocharged Inline 4 motor, capable of cranking out 147 horsepower, 184 pound-feet of torque, and achieving up to 29 miles per gallon in the city and 37 on the highway. This alone makes the Golf an industry leader for any of your travels, but keep reading below to see what else it’s capable of! Throughout all of its various generations and iterations, the Volkswagen Golf has made a name for itself in the looks department. For 2019, it features LED taillights and Daytime Running Lights, a panoramic sunroof, and 60/40 split folding rear seats that can open you up to over 52 cubic feet of cargo space. 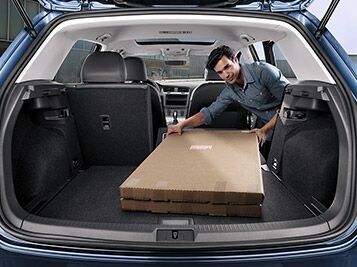 So whether your daily drive consists of taking the kids to school or hauling your valuables to the office, rest assured that the Golf can handle anything. 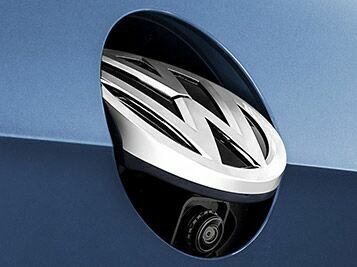 The 2019 Golf is packed to capacity with some of the best technology features available on today’s market. 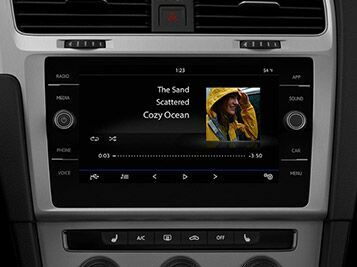 Included among them is an 8-inch glass touchscreen display, Bluetooth®-compatible sound system, and Android Auto and Apple CarPlay app integration technologies. To activate all of these, take advantage of the Golf’s keyless access system with push button start, and let the good times roll! Much like the rest of its Volkswagen brothers, the 2019 VW Golf makes its money in the safety department above all else, achieving a maximum 5 Star NHTSA overall safety rating for the current model year. It’s been able to rise to this level thanks to a multitude of fantastic driver assistance features, including a Rear-View Camera System, Blind Spot Monitor, Adaptive Cruise Control, Rear Traffic Alert, Lane Assist, and many more!